The Cochran INFINITI Gallery of North Hills service center has you covered whenever you need expert INFINITI maintenance and repairs in the Greater Pittsburgh area. Our INFINITI dealership in Wexford, PA, has certified INFINITI service technicians who know your vehicle inside and out, and we’ll handle your vehicle with the care it deserves. You can schedule INFINITI service online or you can enjoy INFINITI Express Service to get maintenance like an INFINITI oil change in 60 minutes or less with no appointment necessary! 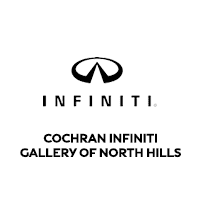 You can also save on routine INFINITI repairs and maintenance with the variety of new INFINITI service specials at Cochran INFINITI Gallery of North Hills. From our flexible INFINITI service hours to our attention to detail, there’s a long list of reasons why so many local drivers turn to us for their INFINITI service needs. Schedule INFINITI repairs now and view our INFINITI service pricing to plan your next appointment!